I have a DR-BT50 bluetooth headset (they are headphones) that I want to use with my MacBook unibody. I didn't use to have any problems, but as of recently I am running into gaps/skips in the sound. This happens mostly in third party music players (including flash/youtube videos) although I see it in iTunes, just less often. I know my headset is ok, because it works perfectly with my phone. Also, interference is unlikely the problem, since the headset works well with the phone one foot away from MacBook, and one would think that whatever is interfering with the computer talking to the headphones would also mess with the connection to the phone. Anyway, I know it's a Bluetooth issue because I have absolutely no problems with wired headphones. That said, I have no idea where to start debugging it. I played with all the Bluetooth options I could find, and reset everything to factory defaults (erasing all devices and re-pairing) yet to no avail. On top of this, maybe related or maybe not (this is an older problem) the Bluetooth audio connection sometimes becomes "garbled". What I mean by this is that, whenever music is playing on the computer I just hear crazy digital noise on the headphones. No errors, no nothing, just continuous garble. I have to turn off Bluetooth on the computer and re-connect to make it go away. Is there anything else I can do, or am I stuck with using wired headphones with my MacBook? The best step to isolating your issue would be to collect some data about the bluetooth environment where you are using your mac. Radio waves come and go with other devices, new phones, degrading antennas and changes in bluetooth firmware. The Bluetooth Explorer is the best tool I have found to troubleshoot bluetooth hardware and data. It's free as part of Xcode from the Mac App Store. 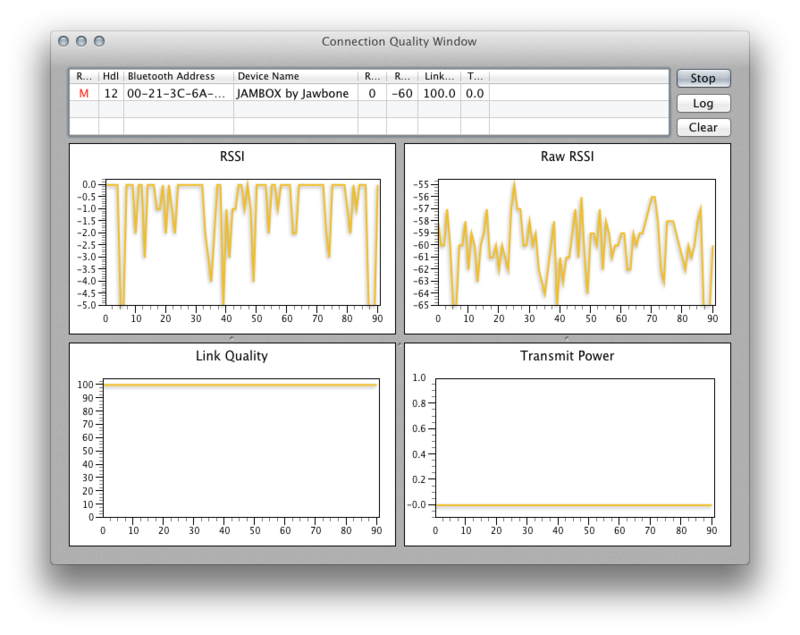 You can debug data issues, see the protocols that connected devices are using, and get to all manner of engineering data relating to bluetooth such as errors, relative signal strength indication (RSSI). It's hard to tell if this will help you, but it lets me know when a microwave or home phone was causing noise issues on several occasions when my hardware was otherwise working properly. Another great hint I found is to alt(option)-click the bluetooth icon on the top menu bar of os x: Then navigate to the bluetooth music device on that menu and it will show you the type of codec being used (atpX in my case). I have also suffered 'popping' and crackling using a Bluetooth stereo headphones on a MacBook Air running Lion. The headphones work perfectly when paired with other devices such as my iPhone 4. I have had substantial improvement by reducing microphone input sensitivity. 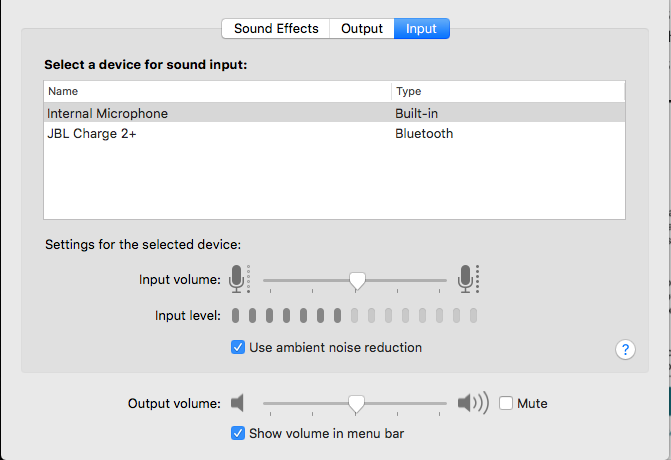 Open the 'open sound preferences' submenu under your bluetooth devices, and reduce microphone sensitivity to zero. OK, so after a whole lot of debugging and reading internet forums, I came to the conclusion that this is a hardware issue. Apparently the bluetooth cable/antenna in a 2009 unibody macbook is inside the screen assembly, on the same cable as the iSight. A while back I replaced the LCD, so I must have nicked the cable/antenna while doing this. I am not opening the display all over again just to fix this, I just got a bluetooth dongle that works flawlessly --- that's how I know it's not a software problem, since I'm pretty sure OS X uses the same bluetooth stack for both transmitters. Disconnect the bt-keybord, the bt-trackpad, the bt-mouse and all the other bluetooth devices one by one while listening the bt-speakers. Then, re-connect the bt devices one by one, and you may see that things continue to work fine on the bt-speakers. I don't know exactly what happens in my case, but maybe, the bt-keyboard reallocate itself to another "free channel" or something that does not interfere with the already connected bt peripherals. I suspect that also the wifi may cause interferences, so while trying to find the responsible of the issue, you may also try to disable the wifi devices while listeing the bt-speakers to identify the guilty device. I have the same issues and have determined that the bluetooth antenna location in my mid 2012 MB Pro is the culprit. I have an Apple BT keyboard and Apple BT Magic Mouse. It is not capable of streaming the BT audio satisfactorily to my 3rd party BT speaker. I've attempted to back off both the keyboard and mouse, but alas, this defeats the reason for them. Interestingly enough, I'm able to stream beautifully to the 3rd party BT speaker with either my iPhone 5s or my mini iPad. This is the case whether I have WiFi enabled or not. I uninstalled Avira antivirus software and the choppiness immediately went away. Go to a store and buy USB bluetooth dongle (I bought the smallest I could find for $8). Plug it in and MacBook automatically shuts down onboard Bluetooth and uses the new USB. After that the music plays perfectly without any stutters at all! My speakers were set as an input device. Changing this back in SystemPreferences > Sound > Input fixed things. Not the answer you're looking for? Browse other questions tagged macbook audio bluetooth .